Stacked beds as an element of landscapedesign found in all of us more often, but still remain a novelty. It looks such a bed is very original, spectacular, space, space takes less than usual, since the lower tier is not too large, and all subsequent - smaller area. Bunk beds with their own hands create many vacationers, making your garden more attractive and bright. What easier way to do this flowerbed? There are many ways to create a multi-tieredbeds with a variety of materials. The main thing is that the design did not seem cumbersome and looked elegant. When you create a vertical beds need to pay attention to the background. The best background for a flowerbed - green lawn, hedges or shrubs. Type of beds depends on the colors using the colors of the same color, it will look totally different than planted with colorful flowers. Designers do not recommend to use in one tierflowers of different sizes. Stacked beds look very organic, if the lower tier of the land with the largest flower buds, and in the subsequent use of smaller flowers. But if all tiers of flowers used, the size of which is approximately the same, flowerbed looks great too. The design of beds of this type is such that the waterfrom lower tiers will flow away, going to the bottom. Accordingly, for the lowest tiers need to choose moisture-loving plants and flowers and make drainage and for the top - those that are not afraid of drought. When you create a multi-tiered beds choose flowers with a long flowering that bloom at the same time - as a flower bed for a long time will retain an attractive appearance and does not need to be updated. While some on the contrary like to change the appearance of the flower beds during the summer, planting new flowers. It's a matter of taste. To create a multi-tiered beds are suitableunpretentious flowers like pansy, petunia, nasturtium, pelargonium, begonia, calendula, marigolds. Colors can be combined as you like. If the plants have flowers of different colors, such as, for example, pansy, begonia or petunia, can create a beautiful flower bed, using only one plant in different colors. Work on a multi-tiered flower bed - it works where you have virtually unlimited. 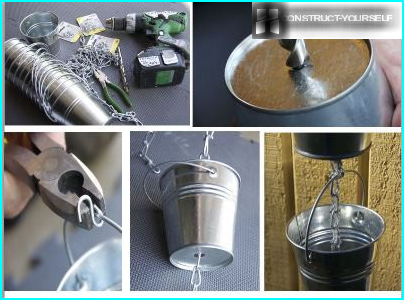 Unleash your imagination and you will be able to create a true masterpiece in his garden. 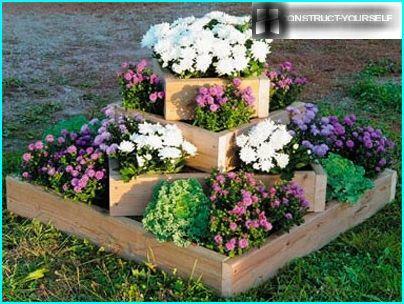 The building block can play the role of the containerflower from which to collect the flower garden. 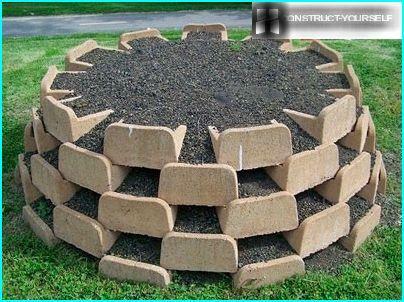 porous lightweight concrete blocks, conveniently planted flowers in a recess inside. The soil is dug groove shaped flower beds, poured down a layer of gravel. Then tier for tier according to the chosen form of blocks are laid out, they poured the earth and planted flowers. Blocks-trays have truncated sides, are availableconstruction firms especially for decoration of flower beds. Longline design and beds can be made by special order in one of the companies that engaged in this. 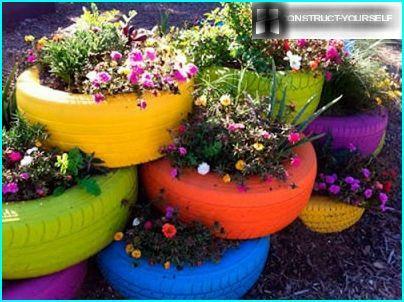 A flower bed of tires can be a decoration of your garden,if you show imagination, paint the old tires and place them in an interesting way. 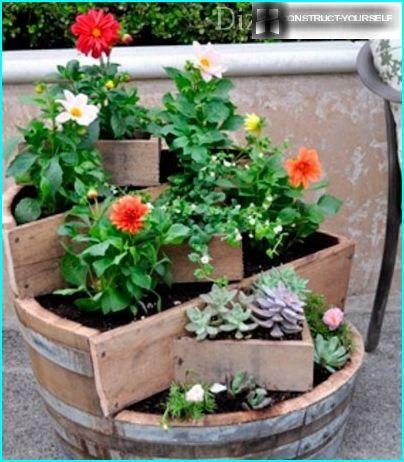 As for any vertical flower beds, the bottom is made drainage - expanded clay, gravel, twigs. Tires are cut across, and then into strips, the biggest used as a lower base. The lower band, rolled into the ring, slightly deepened into the ground and replenish the earth. Similarly, the following tiers are created. Make sure that the space for planting flowers was enough, given that they will grow with time. Illuminating the subject, one can not say about the raisedflowerbeds. This element of landscape design came to us from England. This bed is divided into a florist, raised over a distance of 15 cm to a meter above the ground. 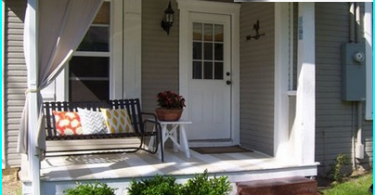 A raised bed is fenced wallsof different materials - wood, natural stone, brick. 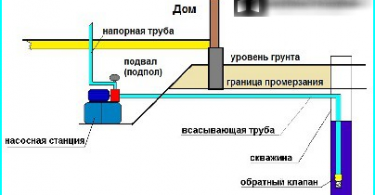 Inside the structure it is necessary to make a drainage layer. These beds have been successfully used for the decoration of areas for recreation, barbecue, but also in itself a single raised bed will decorate the yard and garden. For a flower bed is better to use annuals - bulbs and perennial plants above the soil level may not survive the harsh winter and freeze. 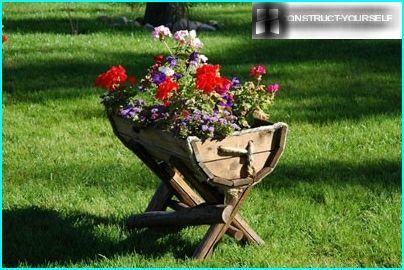 The material that is used to create flower beds, can emphasize the style of garden. 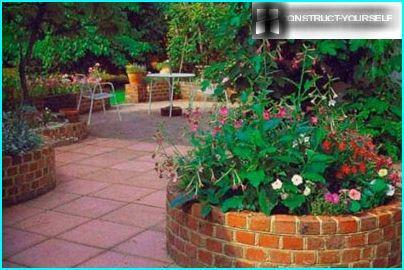 For example, for the garden, country-style suit bricks, in regular garden looks nice bed made of natural stone. In raised beds, in addition to the original type,there are other advantages. If the soil in your yard is not fertile, in flower beds, you can create any conditions and plant interesting plants. In plants room to grow than in a container, and take care of them easier, since it does not need to constantly lean as in the care of an ordinary flowerbed. 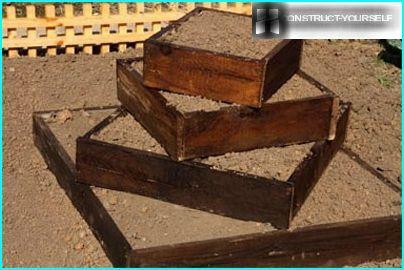 To create a tiered raised beds and useful building blocks. Especially just use them to create a rectangular flowerbed. 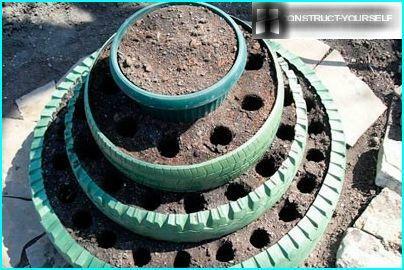 A raised flower bed - a place where there will be goodgrow and effectively look decorative grass -. pampas grass, giant feather grass, crested wheatgrass, etc. Good as it will look and the flowers of the field, if the background is green lawn. Plants in raised beds require more frequent watering, as well as on any other elevation. And vertically stacked, and raised beds in the evening you can highlight, the light sources can be positioned as the bottom, and among plants.